30,000 Stop & Shop grocery workers in New England represented by the United Food and Commercial Workers (UFCW) are in the second week of a strike. The workers say that the company’s offer amounts to a net loss for workers: the small raises will be swallowed up by increased health insurance premiums. In the short term, strikes are disruptive, but they play an essential role in ensuring that an enterprise – whether a grocery store chain, an automaker, or a hotel – serves all its members. When workers produce more, the CEO will see to it that the shareholders get their cut, and competitors will ensure that consumers see price cuts. But without unions, and occasional strikes, workers get left out of the distribution. 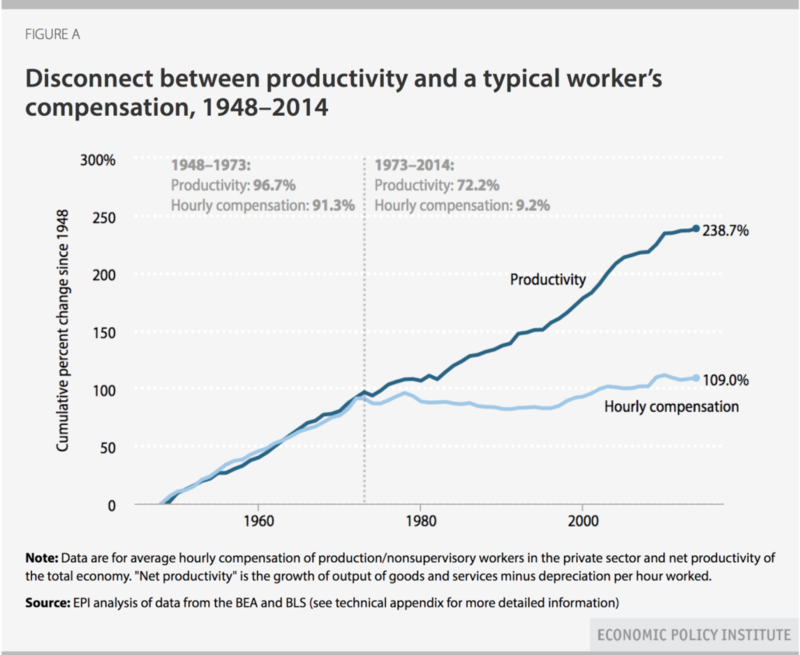 That’s a big reason why wages were unhooked from labor productivity when union membership started sharply declining in the late 1970s. From the 1940s to the 1970s, unions were there to make sure that when workers produced more, they got a raise too – even if this sometimes required a strike. Now that’s no longer true in most sectors of the economy. Grocery stores are one of the remaining sectors where unions still play a major role, and can strike to make sure workers get their share of the profits they have earned. And you get a chance every day to vote for or against worker justice with your food dollars. You can shop at union supermarkets like Safeway, Stop & Shop, Kroger’s and Giant, where workers get to bargain for a fair share, or you can put your money straight to the pockets of CEOs and shareholders at Whole Foods or Wal-Mart. Which will you choose? The common good does not consist in the simple sum of the particular goods of each subject of a social entity. Belonging to everyone and to each person, it is and remains “common”, because it is indivisible and because only together is it possible to attain it, increase it and safeguard its effectiveness, with regard also to the future. Just as the moral actions of an individual are accomplished in doing what is good, so too the actions of a society attain their full stature when they bring about the common good. The common good, in fact, can be understood as the social and community dimension of the moral good . Living in a cynical century where “politics” is portrayed as nothing more than a fight among interest groups, we can be forgiven if we struggle to understand this idea. The Church fathers, Miller reminds us, imported the notion of the common good from the Greeks and Romans. Both saw politics – the pursuit of the common good – as a high calling. A man in ancient Athens or the Roman Republic who devoted his life to accumulating wealth was considered contemptible. One who wished to be honored by their peers would devote himself instead to politics, where he would provide for the common defense, commission public works of art and construct temples to the gods. By the way… With generous support from CCHD, our friends at Georgetown’s Kalmanovitz Initiative are part of a consortium working on a project called Bargaining for the Common Good. The premise is that public employee unions will go beyond seeking their own interests alone, and work with community and civic groups to formulate bargaining demands that satisfy worker justice while meeting community needs and concerns for quality public services. http://catholiclabor.org/wp-content/uploads/2015/10/CLN-logo_565x100.jpg 0 0 Clayton Sinyai http://catholiclabor.org/wp-content/uploads/2015/10/CLN-logo_565x100.jpg Clayton Sinyai2019-04-19 12:21:472019-04-19 12:22:32What is “the common good”? There underlies a dictate of natural justice more imperious and ancient than any bargain between man and man, namely, that wages ought not to be insufficient to support a frugal and well-behaved wage-earner. If through necessity or fear of a worse evil the workman accept harder conditions because an employer or contractor will afford him no better, he is made the victim of force and injustice . Leo hoped that labor unions could help ensure that every worker received a living wage, but understood that government regulation of the economy might be needed as well. Laws setting a minimum wage do just this by setting a wage floor – but if they are to effectively ensure that the minimum wage is a living wage, they must be regularly increased or indexed to inflation. This is certainly why the “fight for $15” movement that initially took hold among fast food workers (who had no union) resonated so clearly with the public. Maryland joins California, New York, Massachusetts, New Jersey and Illinois as states phasing in a $15 minimum; all together, 29 states have set a minimum wage higher than $7.25 per hour. A Catholic Labor Network survey found that both state AFL-CIO presidents and state Catholic Conference directors were likely to cite “increasing the minimum wage” as a policy priority. Last month I spent more time in the US Capitol Building than I had in the previous 12 years I’ve lived in the Washington DC metro area. Why? Because changes in federal immigration policy threaten to suddenly uproot hundreds of thousands, splitting husbands from wives and parents from children – and because my Church and my union are leading the fight to prevent this by preserving DACA (Deferred Action for Childhood Arrivals) and TPS (Temporary Protected Status). 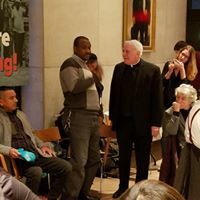 At the beginning of February, the USCCB hosted its annual Catholic Social Ministry Gathering, a conference that brings together Catholic activists from across the nation. After a couple of days of workshops and prayer, participants headed out to Congress to meet with their elected representatives and witness for social justice. Extending DACA and TPS protections was a top issue this year. DACA protects undocumented immigrants from deportation if they were brought to the US as children, through no fault of their own; many of these children remember nothing of their nation of origin, having grown up entirely in the United States. TPS permits those whose homeland has been torn by war or natural disaster to remain in the US until it is safe to return. The president has moved to end both programs, so we urged our House and Senate members to take legislative action to protect their participants from deportation. A week later, I was back. Working Families United, a coalition of labor unions with immigrant members was taking a stand. Although TPS was begun as a “temporary” program, many of these nations took a long time to recover; TPS holders have built careers, married, and raised US-born children here. 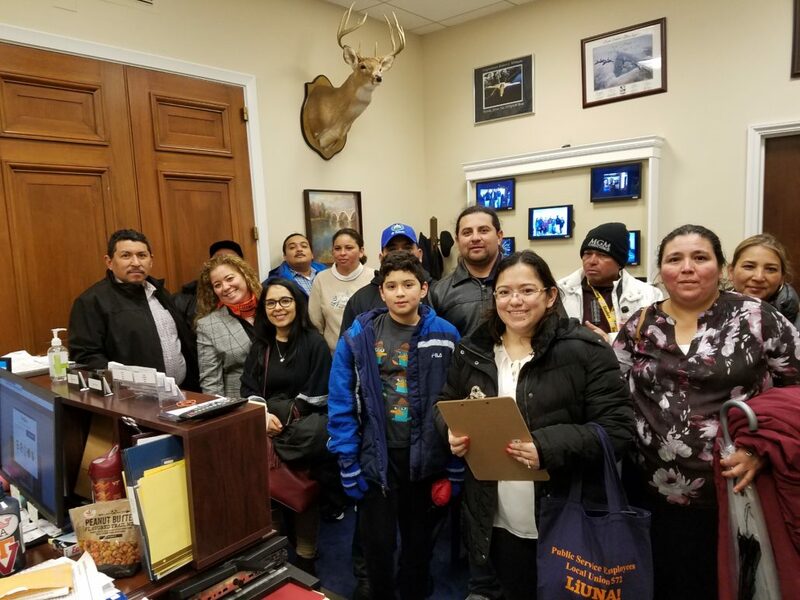 The unions brought members holding TPS from across the country to Washington DC and accompanied them to the Capitol to tell their stories. In Exodus 23:9 we read how God told the Israelites, “You shall not oppress a resident alien; you well know how it feels to be an alien, since you were once aliens yourselves in the land of Egypt.” One of the key goals of the Church-Labor Partnership Project (CLPP) is to bring Church and labor together to advocate for immigrants in a time of increasing nativism. We will continue to bring you news as Congress debates how to move forward. As many of you know, the US Conference of Catholic Bishops’ Department of Justice, Peace and Human Development hosts a meeting in Washington DC in early February each year, drawing several hundred Catholic clergy, religious, and lay social ministry leaders from across the United States. The Catholic Labor Network is a collaborating organization in the CSMG, holding our annual meeting the morning before the opening Plenary and contributing to CSMG program itself. 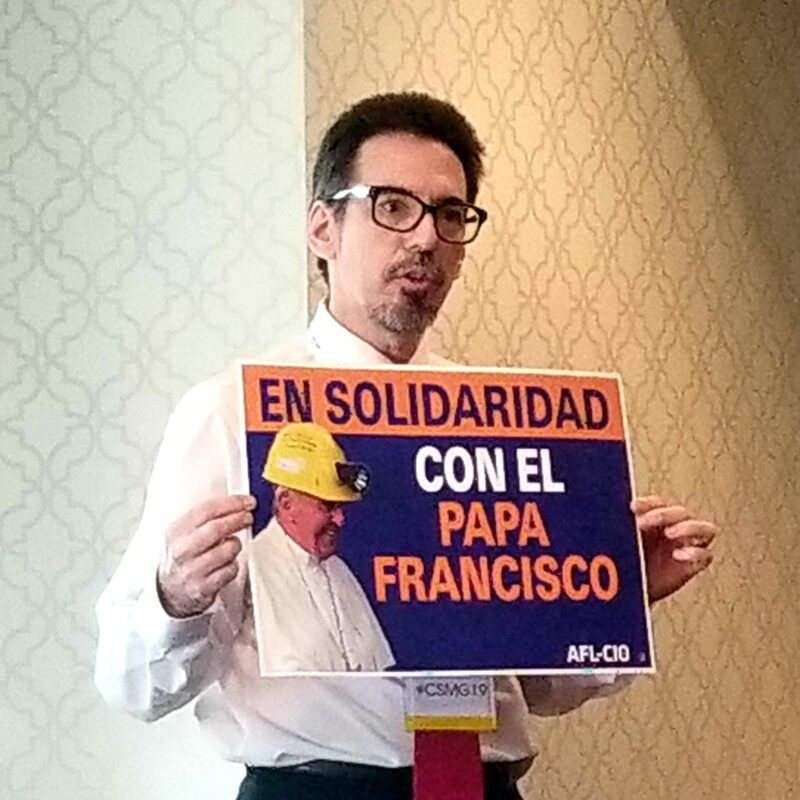 In a special highlight of this year’s program, workers from labor organizations partnering with the Catholic Labor Network in the Church-Labor Partnership Project (CLPP) shared their stories at our meeting and in a CSMG workshop hosted by the Catholic Labor Network. Nelson Robinson, who works for a contractor at National Airport preparing meals for airline passengers, talked about how workers like him in airline food service across the United States had organized with UNITE HERE, the Hotel and Restaurant workers’ union, to campaign for living wage jobs with affordable health care. In several communities they worked with community and Church organizations to improve conditions by securing “living wage” requirements for airport contracting employees. Now they are bargaining with the three large companies that dominate airline food service to reach the remainder and to secure family health coverage with premiums they can afford on a worker’s paycheck. 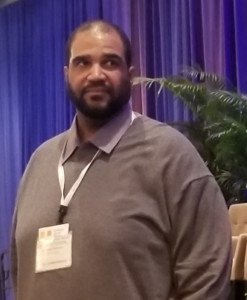 Finally, Anthony Jackson from the Bakery Workers’ union shared the story of Nabisco workers like himself whose jobs are threatened by globalization and outsourcing. Baking Oreos and other Nabisco snacks is a major source of middle-class, family-supporting jobs for African-American workers in Chicago and other US cities, but their new multinational owner Mondelez seems determined to slash wages and benefits one way or another. When Chicago workers resisted deep wage and benefit cuts, Mondelez shifted production to Salinas, Mexico, laying off Jackson and hundreds of other workers. Now the company is demanding that all remaining US employees not just give wage concessions, but give up their pension as well, and Jackson, now an organizer for the union, is bringing their story to audiences across the country. 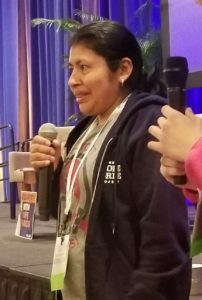 (The union even visited the new workers at Salinas, learning that Mondelez had not lived up to its promises to workers there.) Cardinal Tobin of Newark, whose Archdiocese contains one of the other plants, has addressed a letter to Mondelez on the workers’ behalf. The CSMG’s rich program also included a well-attended workshop on just wages, the theme of the Bishops’ 2018 Labor Day letter. Much of the agenda focused on race and racism, exploring the Bishops’ new Pastoral letter on the topic, Open Wide Our Hearts. 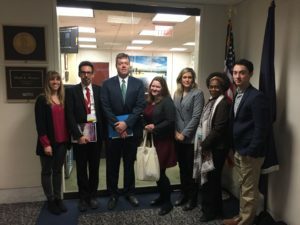 It concluded with Hill visits by participants to lobby their elected representatives on social justice concerns, including a renewal of DACA and Temporary Protected Status for immigrants. More on that next week! While we as Catholics have a great reverence for Mary and frequently invoke the Magnificat, I’m not so sure we do that much better. I certainly read and prayed the Magnificat for many years before taking note of what Mary was saying about God’s “preferential option for the poor.” Ms. Mayfield, the author, notes that Archbishop Oscar Romero favored this text, but I can’t recall ever hearing a priest or deacon preaching on this text explore what it means to have a God who fills the hungry with good things but sends the rich away with nothing. And hats off to Ms. Mayfield for introducing me to Ben Wildflower’s amazing woodcut print inspired by the prayer! As we reported in October, Catholic hospital chain Ascension Health was moving to close the financially stressed Providence Hospital, located in an underserved, largely African-American DC neighborhood. The action prompted outcries from hospital employees – especially nurses represented by National Nurses United – as well as the community and DC government. Under pressure from the City Council, Providence moved ever so slightly, agreeing to keep the ER open through April and keep 10 or 15 beds. DC Attorney General Karl Racine filed suit, arguing that Providence was violating the terms of its DC operating license with the abrupt reduction in care, but the DC Superior Court rejected the city’s argument. 2019 opened with a partial government shutdown underway as the president and Congress failed to reach agreement on a budget. Congress wanted to continue funding the government under current program funding levels, while the president said he will keep the government shut unless Congress adds a $5 billion budget item to pay for a wall on the Mexican border to prevent illegal border crossings. Some 800,000 federal employees are now facing dire straits. Many, such as law enforcement personnel and Coast Guard sailors are working without pay; many at the Centers for Disease Control, National Institutes for Health, and Food and Drug Administration have been sent home. In past shutdowns, Congress made whole employees who missed paychecks due to such political gamesmanship, but there’s no guarantee that these workers will ever see their money. Like many Americans, a lot of these workers are only a paycheck away from missing mortgage, rent and bill payments. The Office of Personnel Management has advised them to “consult with their personal attorney” (!) to fend off creditors, or to offer landlords a hand with painting and small repairs in exchange for missed rent payments (!!). It’s no wonder that the American Federation of Government Employees (AFGE) is filing suit on behalf of prison guards and others forced into unpaid labor, which certainly sounds illegal. The effects are rippling well beyond the federal employees themselves, and not only in the ugly pictures of overflowing trash piling up in our national parks. Government buildings run on the labors of security guards, custodians and food service workers employed by contractors – many of these employees have been laid off and will almost certainly not get back pay. And now comes news that the food stamps and WIC programs that feed the poor are being disrupted. Please keep in your prayers all those who have had their lives turned upside down by the shutdown, and urge our elected leaders to stop holding our public services and public servants hostage for their political agenda.